AIM BarleyLife capsules• 280 vegetarian capsules / 40 servings• Provides a full spectrum of nutrients• Capsules dissolve rapidly for excellent assimilationand absorption• Great for travelers and people “on the go”• Free of animal products, soy, and wheat. AIM BarleyLife Sample Packs— in convenient single servingsAIM’s Sample Packs come in handy, resealable pouches containing six single servings of BarleyLife or BarleyLife Xtra. Heading out on vacation or just a quick trip somewhere? Want to share BarleyLife with someone? Looking for a handy way to carry some BarleyLife as you go about your day? The single serving Sample Packs are the answer. 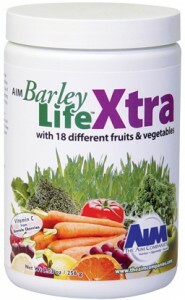 AIM BarleyLifeXtra powder— when taste makes all the differenceBarleyLife Xtra is a delightful, cherry-apple flavored green barley juice powder with 18 different fruits and vegetables. With only one gram of sugar per serving, BarleyLife Xtra provides a healthy, nourishing alternative to the plethora of sugar-filled drinks available today. Children and adults alike enjoy this smooth, pleasant drink. • 9.03 oz (256 g) powder / 57 servings• Provides a full spectrum of nutrients• No artificial sweetener, coloring, or preservatives• Free of animal products, soy, and wheat• Each 4.5 g serving of BarleyLife Xtra contains 4 g BarleyLife• Great source of vitamin C—a 4.5 g serving contains 34 percent of the Recommended Daily Intake. Folate is a water-soluble B vitamin that occurs naturally in food. Folic acid is a form of folate that is found in some foods and also in supplements. Folic acid helps produce and maintain new cells—it is needed to make DNA and RNA, the building blocks of cells. This is especially important during periods of rapid cell division and growth such as infancy and pregnancy. Research has shown that women who take folic acid before and during pregnancy have a 70 percent reduction in incidents of spina bifida and other neural tube defects. Folic acid also helps prevent changes to DNA that may lead to cancer. Both adults and children need folate to make normal red blood cells and prevent anemia. Three servings a day of AIM BarleyLife provide over 30 percent of your RDI of folic acid. Vitamin A, a fat-soluble vitamin, plays an important role in vision, growth and development, immune functions, red blood cell production, reproduction, and the development and maintenance of healthy skin, hair, and mucous membranes. Vitamin A can be found in two main forms in foods: • Retinol from animal and synthetic sources• Carotenes that are synthesized by plantsThe vitamin A in BarleyLife is beta-carotene, which is the most efficient of the carotenoids for conversion to vitamin A in the body. Vitamin A is also an important antioxidant known to protect cells. Beta-carotene has been linked to the maintenance of ocular, cardiovascular, and immune health. AIM BarleyLife is a great source. Green barley grass has a strong alkalizing effect, which helps keep the ratio between acidity and alkalinity in our body fluids balanced. Our cells cannot function efficiently if the pH (which measures acidity and alkalinity) is not in a narrow range. Most processed foods are acidifying, and when we consume too many of them, the acid-alkaline balance is upset. Green barley grass contains the alkalizing minerals potassium, calcium, and magnesium. These minerals neutralize acidic materials and can help maintain a healthy acid-alkaline balance. Order an AIM pH Test Kit (5488E US) to determine whether your body is acidic or alkaline. 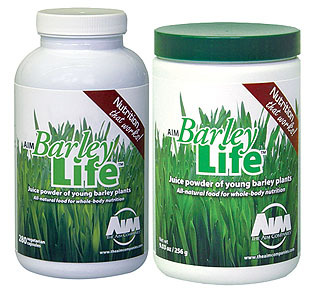 AIM BarleyLife: Green barley leaves contain a multitude of enzymes. Enzymes are essential for the thousands of chemical reactions that occur throughout the body, including the absorption of digested nutrients. The enzyme superoxide dismutase (SOD) is a powerful antioxidant thought to slow the rate of cell destruction by providing a defense against free radicals, especially the most prolific free radical, superoxide. Superoxide free radicals are thought to be responsible for the breakdown of synovial fluid that leads to the inflammatory response in joints. Much of the current clinical research on SOD is focused on arthritis, bursitis, and gout. SOD is heat sensitive, and it is considered to be a measurement of overall enzymatic activity. If SOD is present in a food in an active state, it can be concluded that the other enzymes in the food are also present in an active state. Enzymes are not found in processed and cooked foods. Maximum nutrition and live enzymes is the AIM difference! 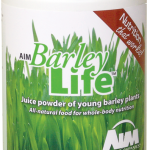 AIM Barley grass juice — a wide spectrum of potent nutrients. Research in the late 20th century revealed that young barley grass is the most nutritious of the green grasses. While barley has been used as a grain since ancient times, the value of barley as a grass was overlooked. Japanese researchers discovered that the young, green barley grass was an incredibly complete source of nutrition, containing a wide spectrum of vitamins, minerals, amino acids, proteins, enzymes, chlorophyll, and phytonutrients. Researchers also discovered that young barley is at its nutritional best before the beginning of the reproductive cycle, when the plant channels nutrition to the seed heads. In fact, when harvested at this early stage, young barley leaves have a different nutritional makeup from their adult counterparts. A dilemma arises when we, as humans, attempt to derive nourishment from this nutrient-rich barley grass. The human body is not equipped with the enzymes to break down the fiber in the barley grass. Thus, without intervention, this nutrition remains insoluble and is, therefore, not bioavailable to the human body. As research progressed on young barley grass, it was discovered that, when grass was juiced and fiber removed, the vast nutritional profile of barley was unlocked for human consumption. Barley grass became bioavailable. However, the nutrients in the liquid state were quite fragile and had to be consumed within a very short time to retain their nutritive value. To provide a realistic shelf life, one more step was needed to make this barley juice readily available to humans. A unique processing method. How can the nutrients in barley grass be kept from oxidizing and losing their potency? AIM uses an advanced processing technology in which the barley leaves are harvested with stateof-the-art equipment when their nutrients are most potent and alive. Within minutes, the leaves are juiced (not milled, as in many other barley grass products) and processed using the most advanced, innovative, and efficient cool processing method for maximum nutrition and fresh-tasting juice powder. Checkout my other blogs at www.aimforbalance.com and MyFathersWellness.com for additional information on AIM BarleyLife and other AIM products.